Wearing the right equestrian clothing ensures not just the riders safety but also their comfort. A riding headgear is one of the most essential items when riding a horse. 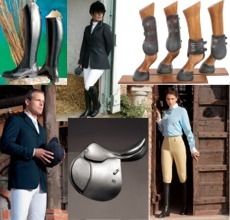 But a rider also needs other horse riding apparel like riding boots and other equipment. These items can be costly but purchasing from online store allows you to research brands and product reviews before making an expensive purchase. Make sure you get the most for your money, buy only good quality equestrian clothing and equipment.